There is seldom a practical reason for me to traverse the length of Albany Avenue in Kingston. It’s a pity, because the street has a number of overlooked architectural gems, (in an overlooked town full of them). There is a stretch of the avenue which connects uptown (in reality, downtown) Kingston to the city's outlying suburban sprawl, that contains a couple dozen significant nineteenth and early twentieth century homes. Even for those who regularly drive the street, taking advantage of its commercial offerings, I imagine it is easy to miss a delicately wrought neoclassical detail or a stately urn gracing a lawn, in one's rush from muffler replacement to tae kwon doe lesson, to Kentucky Fried Chicken fix. However, to take the time to drive the street at a leisurely pace, or better yet, to park your car and walk up and down the stretch, is an effort well rewarded. For me, part of the street's appeal is that it offers an extant visual timeline of housing patterns and development typical of America’s older towns and cities. From the nineteenth century cemetery marking the outer boundaries of the original city, to the McDonalds less than a mile away, one can see early farmhouses, cheek and jowl with grand 19th century homes, suburban bungalows and sears kit houses interspersed with low slung cinderblock commercial buildings, along with the familiar outlines of suburban gas stations and fast food chains. Each successive wave of development left its mark, without obliterating the neighborhood's previous incarnation in its wake. As a result, you have an interesting mix of commercial and residential usage. The housing stock is in every in every possible state of repair, disrepair, preservation, desecration, and renovation imaginable, but the overall impression it gives is of a cared for, lived in, historic neighborhood. I typically approach the neighborhood from the north. To get to Albany Avenue, I must first cross one of the most frequently visited and perhaps one of most aesthetically reviled parts of Kingston. Driving south on US 9W (also known as Ulster Ave) takes you through Lake Katrine's All-American Mall, Strip Mall, Big Box, and Family Restaurant "Hades". Bearing right as Ulster Ave splits from 9W, and driving over a viaduct, things begin to change very slightly. You are still in very suburba low-slung cinder block construction, but the national chains such as Starbucks, Lowes, and Applebees, give way to independently run businesses; rug and carpet warehouses, chinese restaurants, car dealerships and resale shops. Right around the McDonalds , you cross the city line and Ulster Avenue officially becomes Albany Avenue. Expect no miraculous transformation, but you can observe how suburban commercial buildings from the 50's and 60's are interspersed with, or sometimes built around, former suburban homes. Around Foxhall Avenue and the KFC, the real transition begins. Businesses that occupy former homes become more prevalent. Interspersed with these businesses are actual residences, some multi family but also a number of well maintained single family dwellings. By the the time you cross Flatbush and Manor Aves, the neighborhood is solidly residential. There are still a fair amount of businesses, but they tend to be the type that make palatable neighbors for people in the neighborhood, providing goods and services they might use (medical offices, lawyers, funeral homes). Unlike similar neighborhoods developed during the same era, where middle and upper class families tried to "keep up with the Joneses", by building houses that looked eerily similar to their neighbors', there is a delightful amount of architectural variety to be found in the homes on Albany Avenue. Almost every home here has something to set it apart from its neighbor, warranting a second look. Many of the larger and grander homes do fall into several general categories, however. The first being the late nineteenth and early twentieth century variations of the style commonly referred to as "Queen Anne" Within this general family, there are several outstanding homes in the stick and colonial revival styles. 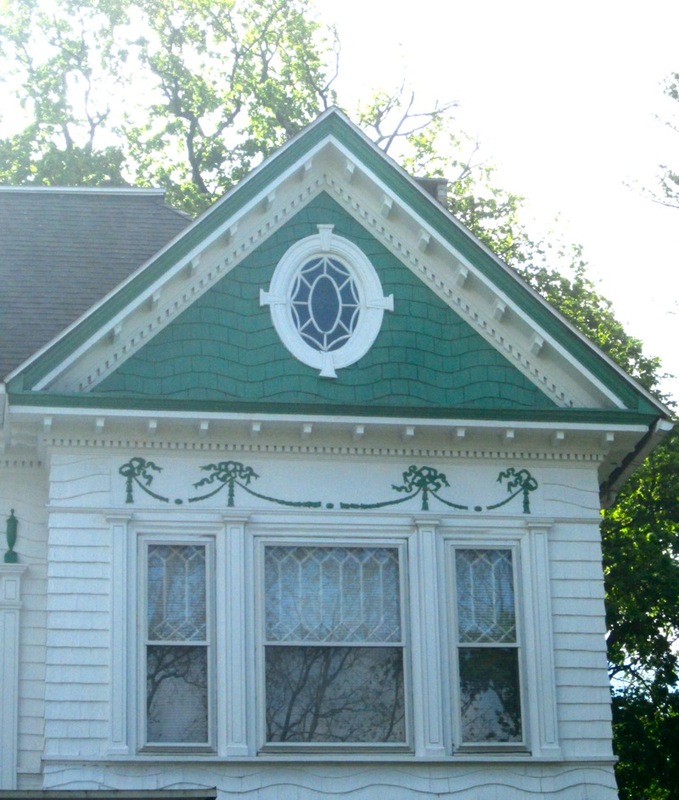 The next overarching category would be what are referred to as early twentieth century "revival" styles. On Albany Avenue, examples loosely based on English styles predominate, including "tudor", "arts and crafts", and "georgian". Interspersed with these homes are solid survivors from earlier eras. Several stone federal farmhouses and suburban Italianate villas recall the time when this neighborhood was outside the city limits, on the main road to Albany. In the midst of all these, are my two favorite buildings in the neighborhood. The first is a textbook Second Empire mansion. Though it has seen better days, it is remarkably intact. From the slate roof topped roof with its decorative ironwork to the patterned brickwork of its walls, it is a remarkable building. Even partially obscured by the tall pine trees in front, it dominates its next door neighbor, the Temple Emmanuel, my other favorite from the neighborhood. It is a surburban synagogue right out of the 1960's, in the school of Durrell Stone and Lapidus. In looking at the homes, pay particular attention to the details. Delicates wreaths and mouldings, robust color palettes, and interesting sculptural elements all contribute to the overall character of the neighborhood. Even on buildings that have been egregiously modernized or altered, a corinthian capital or an interesting roofline can offer a tantalizing glimpse into the grand pasts of these otherwise nondescript looking buildings. When you reach the historic Sharp Burial ground, opposite a charming little dutch revival colonial you are at the end of this neighborhood. Continuing south takes one into the Stockade district, a much larger section of Kingston, holding many more architectural treasures. No time for that now, I have a Tae Kwon Doe lesson about to start, right at the other end of Albany Ave.